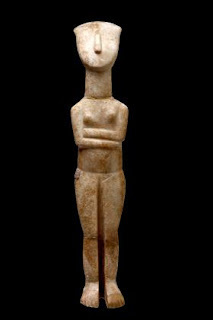 A new exhibit at the Sakıp Sabancı Museum scheduled to open at the end of May is the first exhibition of Cycladic Art ever held in Turkey and will feature 600 pieces from Greece and various pieces from Turkey, in a large-scale collaboration between the two countries. The exhibit “Karşıdan Karşıya” (From One Side To Another) concentrates on the civilization and culture of the Aegean Sea region 5,000 years ago. The inhabitants of the Aegean islands known as the Cyclades produced unique marble figurines and vessels, bronze tools and weapons as well as pottery between 3200 B.C. and 1100 B.C. These physical items demonstrate the extensive commercial and cultural relations between both sides of the Aegean Sea through the islands. While this is not the first time museums in Greece and Turkey have cooperated, it is a first in terms of scale. The Greek National Archaeology Museum in Athens and the N.P. Goulandris Foundation Cycladic Art Museum are providing material to add to works of art from 14 museums in Turkey. The exhibition, which will be the first exhibition of Cycladic Art ever held in Turkey, will open on May 24 at Istanbul's Sakıp Sabancı Museum and continue until Aug. 28.